After a late night out last night, we were looking forward to a lazy Saturday morning. Nothing was on the schedule until a dinner with some International students tonight. We slept in a bit, and David kindly got up with M who was up around 8am-ish this morning. 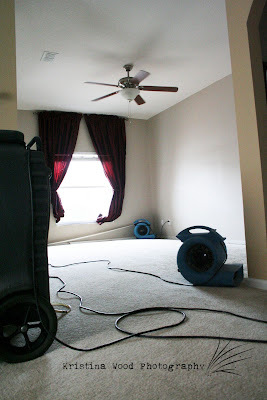 But, as soon as they hit the bottom of the stairs, M noticed a problem: wet carpet. The strange thing? The bathroom floor, adjacent to the wet carpet was dry. We walked a bit further. Dry, dry though the dining area, then wet again, REALLY wet in the family room. 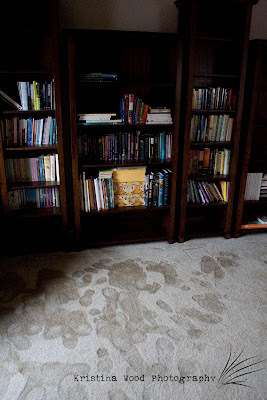 Soaking wet coming through the wall by our bookcases. Those footprints? Yeah, that's water. We stepped outside and noticed that water was dripping off of our neighbor's awning from the second floor. He lives in the town home next door to us. Not good. Not good AT all. Our neighbor is away on business and not home, but our neighbor next door to him came out and was experiencing similar problems in his kitchen. Several boxes later, our family room is now stored safely in the garage. 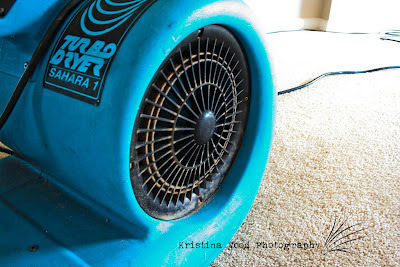 Turbo Dryer Sahara 1, you are my friend! We are now awaiting the plumber. Why? Well, when Dean, our wonderful Service Master removed the baseboard in our bathroom to get to the pooling water our from under our staircase, he heard a strange hissing sound that resembled leaking water. The cause? Most likely a nail had been nailed through a water pipe while mounting the baseboard. Brilliant. So now we are without water...but with water. Ah, the irony of life!